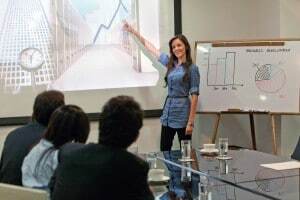 Business PowerPoint Presentations have changed a lot in the last ten years, but some of the best presentation secrets have been around for a while. Almost 25 years ago I was given a little book published in the 1950’s. It was entitled, “Public Speaking as the Audience Likes It”. I don’t remember much of the contents, but I do remember this point... When you are preparing to make a presentation, consider the audience and think about the best way to present your material so they will enjoy the experience and remember the valuable material. Below is a list of three things that will help you better relate to your audience when you design a business PowerPoint presentation. Before you start to design a business presentation, spend some time thinking about those who are going to receive your message. What do they have in common? What do you know about who they are? What do they feel? What experiences have they had? Where are they coming from? Consider, from the audience’s perspective. What is so important about what I have to say? Why should they listen? How will they benefit? And how can I help them enjoy the experience? Too often we begin our preparation thinking about what we want and need to say. We think about major point and what information we need them to assimilate or remember. We think about our responsibility, and if we have any fear or trepidation about being in front of people, we just wish it were over and prepare the message without much thought given to the audience. Dr. Michelle Mazur wrote an article for FastCompany called 5 Ways To Make The Audience The Star Of Your Presentation about this challenge. She identified three specific questions that you can ask yourself that will help you get into the psyche of your audience. Most presenters do the opposite. They prepare the message without much thought given to the audience. They think about the message, what they want to say and how they are best going to say it; they prepare their PowerPoint slides hoping that will “wow” the audience into valuing the material. They remember the KISS method of presentations and they keep is simple, stupid. Maybe they remember the old adage, stand up, speak up, shut up, sit down. Fun little sayings, but not much help. However through that entire process, they forget entirely about what the audience really needs or wants. First in your PowerPoint preparation is to consider the audience and the best way to communicate with them. Think about the specific people, the demographics, commonalities, idiosyncrasies; examine them from every angle you can. Also consider your venue- where you will be making your presentation. Will you be on a stage with people seated in front of you; will you be on the same level as your audience; will they be at tables, round or square; will you use a microphone- hand held, lapel, or stationary; what kind of interaction can I facilitate, and the list goes on based on your own experience and creativity. But always consider your audience; it will influence the rest of your presentation. The days of getting up and speaking and then sitting down have past. We live in an age of reality TV in which we get to vote on the results, interactive games on the computer and via game modems, we have unlimited accessibility through cell phones, email and texting. Dscout.com conducted a study in 2016 where they had more than 100,000 participants download an app that would track the number of interactions they each had with their cellphones. The average user swiped their cellphone screen 2,617 times each day. So you have considered your audience, and you know your message, now how do you get the audience involved? It is more than asking questions and showing slides, it is putting something in their hands, it is incorporating movement, it is using as many of their senses as possible to get them and keep them involved. Nearly every book on public speaking skills written within the last 15 years has a section on telling stories, but don’t just tell a story, show it. If you were riding a bike, then show it; if you were going over something, show it; if you were involved in a heated conversation, show it; if you were throwing a ball, show it. Never just tell a story, but show it. Use gestures and plenty of them. Are you talking about something, an object, show it. Better yet, if possible give everyone a sample. If you are talking about something with an aroma, then work the smell into your presentation. Use a candle, home baked cookies, incense, whatever it takes. Perhaps it is a sound, a firecracker, jet engine, or ocean waves. Find a way to duplicate it for your audience’s aural stimulation. Perhaps it is a taste. Give them something to remind them of the taste, a candy bar; a drink; an ice cream -- be creative. Maybe it is a texture. If so, then give them something to feel. Give them sandpaper, a piece of cloth, a rock, use your imagination, but incorporate some type of extra sensory experience for your audience to participate with you in the presentation. Be creative and push the envelope. Below are a few fun ideas that I have used that got the audience involved in my presentations. I handed out ice cream. I once gave the audience latex gloves and pens so they could take notes on their hands (five points-five fingers). I once lit incense prior so the room would smell like pine trees. I once gave out hotel size soaps and had the audience try to write my key points on the soap. When the soap inevitably slipped out of their hands, I made the point that opportunity sometimes just slips through our fingers. I've spoken in both a Santa Claus suit and a guerrilla outfit (not in the same speech, though). In one speech, I gave the participants small craft packages to built a boat made out of wooden ice cream spoons, a toothpick, and a piece of cloth. I've also given out colored pipe cleaners for participants to fashion antennas. The ideas are as limitless as your imagination. Do it. Get your audience involved. Once you have delivered the main thrust of your business PowerPoint presentation and have involved the audience, you always want to leave them wanting more. Be concise in your closing remarks. Highlight the high points and then be on your way. Too many speakers close with their main points but continue to drag on thinking that re-emphasizing will make the message stick. When it is time to end, then end. Don’t keep re-covering the topics and never introduce new material. If you have considered the audience, gotten them involved, then you can make a quick recap and let their involvement continue to speak after you have stopped. According to Lumen Learning, the purpose of a good conclusion is two-fold. First, it signals to the audience that your presentation is coming to an end. Lumen cautions that "while this may sound unimportant or superfluous, if you do end your speech without indicating you are about to do so it can feel extremely abrupt and confusing to the audience. Make sure to give the audience closure with your ending." Secondly, (and more importantly,) it "help(s) them remember the most important points from the speech". So if your conclusion is vague or abrupt, there is a possibility that the audience will be less likely to remember your main points. So, include your key points in your introduction, your content, and your conclusion, and you will increase audience retention dramatically. So if you really want to spice up your business PowerPoint presentations and make your presentations more powerful and memorable, first, begin by designing your presentation from your audience's perspective; second, be creative and get your audience involved throughout the presentation; and third, make your closing concise. If you do these things, your audience will retain the content longer and pay attention to your presentation in a more meaningful way. Craig Wagganer is a speaker and trainer specializing in Business PowerPoint Presentations training and skill development.